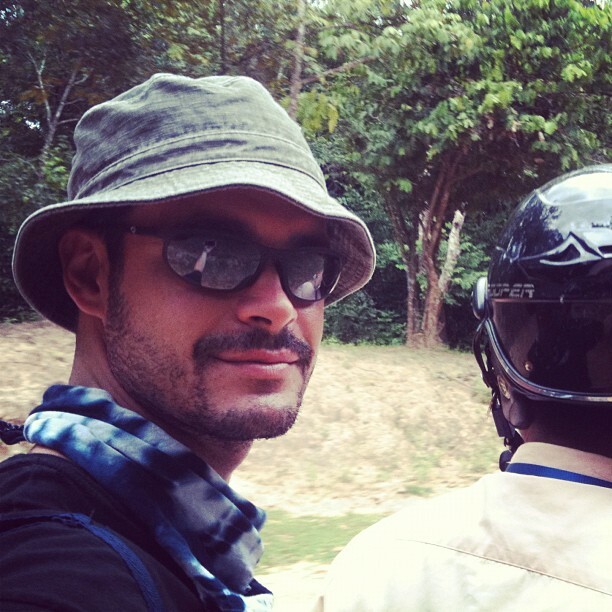 I took an express train to the Hong Kong airport and a moto-taxi to my Siam Reap hotel. 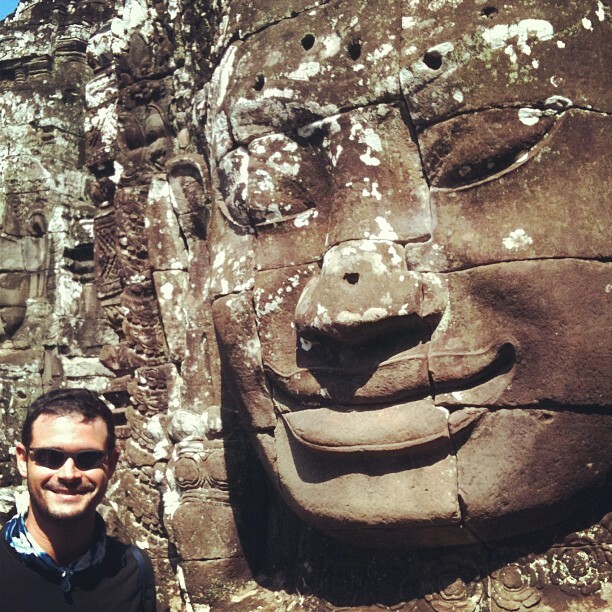 Since I hadn’t planned on visiting Cambodia —and prices were cheap— I was lazy and went with the hotel Jose Luis’ travel agency recommended as part of a package. As I go into my room, I’m pretty confident I won’t be murdered in my sleep. However, the old axiom of at a low enough price, hostels/guesthouses are better than hotels stills rings true. I pick my backpack and open the closet… after a second I drop it back on the chair. If it’s going to be stolen, let it depart my hands with some dignity. It’s only 10pm, I might as well take a walk and grab a beer. I follow people down to Bar Street, and along the way get offered everything from marijuana to something that is either a very fine local dish, or a massage I’m too naive to know about. The bar where I sit is across the street of an open two floor club/restaurant. The music is loud and tourists are happy. The same western popular dance songs keep playing over and over again. A few guys in their 50’s walk by with young local girlfriends on their arms. I try not to judge, but fail. I order draft Ankor beer, it’s $0.50 a glass. My sentimental norwegianess calculates that the beer is free and they charge for it being cold. Looking around I’m reminded of my Dad telling me he was once on an oil platform and there was fire, gas, electricity and water surrounding him in the most precarious ways. All the things my grandfather had warned him about when little, together in the same place. I relate to the story somehow right now. Next day at 7:30am I meet my guide, Em Somuch. 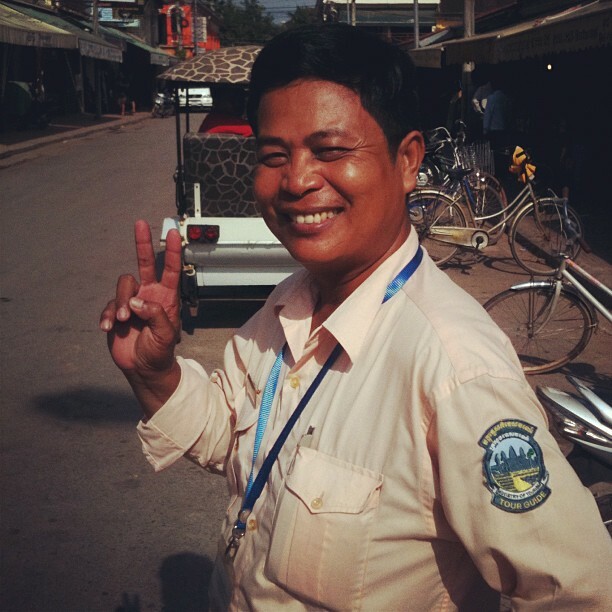 In his late 40’s, he has a wide smile and starts talking as soon as we shake hands. Since I’m not fully awake yet, I start nodding while he gives me the lowdown of the plan, and wait for him to name the price. Suddenly he’s quiet and looking at me expectantly. Great, seems Em has been talking with my parents. He looks surprised, but not disappointed. I don’t know why, but I’m relieved. Since he already touched on my relationship insecurities, I’m not ready to let him know I’m a wuss. My mom is going to kill me if I survive this. 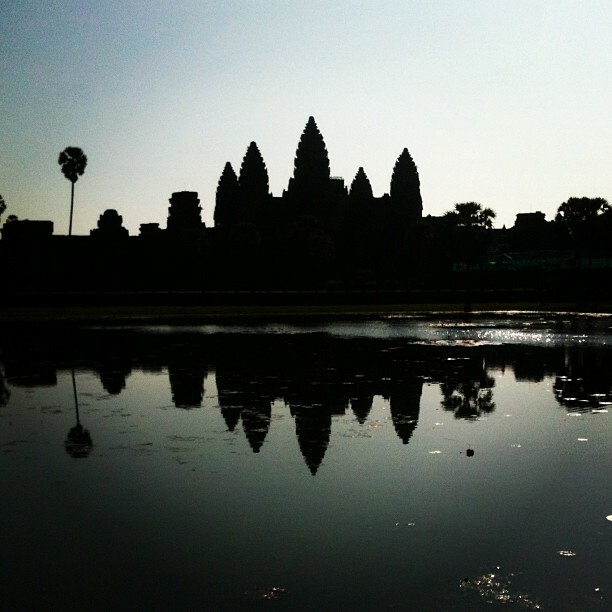 Angkor temples are beautiful. Big sparse constructions with complex details surrounded by jungle. Once the center of large cities, now they are part of an archeological park. The temples themselves have had changing personalities. Many started as Buddhist temples and were changed to Hinduism and back as new Kings came. One in particular was originally meant to accept all religions, each with it’s own entrance, so people could worship together to different gods. Of course, the next king changed it. A detail that fascinated me is what I can only call protocol by design: most doors are very tall, but as you got closer to the center, the height falls considerably. When I asked Em if their priests were particularly short, he laughed and explained this was to force subjects to bend over and make reverence. Similarly, the steps people used to approach the king were extremely steep and small. This required anyone coming up to basically crawl their way up to the king’s presence. If you’re really into Indiana Jones or Lara Croft1, you can spend at least three days visiting temples, especially if you go out of your way to lesser known ones. Pretty sure she was smiling at the scarf. Personally, by the afternoon of the second day I was templed out. Without shame I spent the rest of that day on the hotel pool reading the Steve Jobs Biography. The last day I spent walking around the markets (if any family member is reading this, your Xmas gift probably was made and bought in Cambodia). Negotiating is fun but tiring. Glancing at anything will immediately be accompanied with a person shoving a big calculator in your face, while saying “for you, $10”. Since I’ve never been a great negotiator, I just pushed the price down as much as my catholic guilt would allow, and then increased the quantity of goods for the given price. Worked almost every time. I found the people friendly and talkative, although make no mistake about it, everyone is out for your dollars. But in almost every case, you get food, service and products that have some effort put into it. In other words, it’s not a giant tourist trap. There’s also a subtle layer underneath everything you see in Cambodia. And unless you ask, it never comes out. Most of the people I talked with were not from Siam Reap. The stories of why they came could each be a harrowing movie. Em has a bullet wound on his upper leg from his time as a soldier —which he will show you if you want to hear the story, regardless of how many times you repeat it’s not necessary. He spent 10 years in a refuge camp in Vietnam. Yet, he was as professional of a tour guide as any other place I’ve visited. And as such, when he said it was $40 a day —scooter included— I gladly paid. Not out of compassion or pity, but because he earned it2.